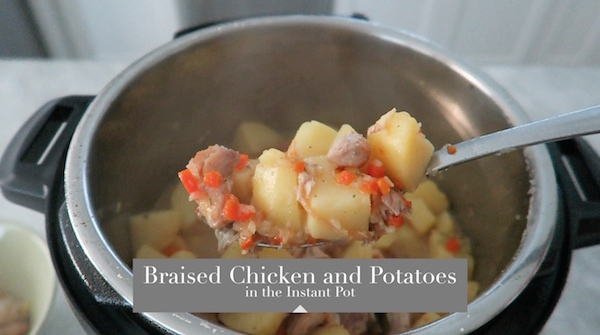 Braised Chicken and Potatoes in the Instant Pot gives you tender chicken and potatoes, with aromatic onions, carrots and garlic. 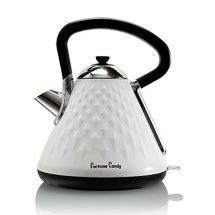 In a fraction of the time, the electric pressure cooker prepares the entire meal in one appliance. A year ago, I bought an Instant Pot and now it’s one of my favorite small appliances. I use it at least a few times each week. Whenever I share one of our Instant Pot meals on Instagram or Facebook, I get many requests to share the recipe. Last week, when I was making these Braised Potatoes, I grabbed our simple point and shoot camera and filmed the process. Both of my boys were in the kitchen with me, so you’ll see a little peek of my little one, who sneaked into a shot or two:). The Braised Chicken and Potatoes taste wonderful. The chicken and the aromatics – onion, carrots, and garlic get sauteed until they are golden brown and all the brown bits on the bottom of the pot are deglazed with the water, which elevates the overall flavor immensely. I leave the potatoes on the very top, so they essentially steam, and even though they are cooked through and tender, leaving them on top keeps them from falling apart into mush. I grew up eating Braised Potatoes. It was one of my Mom’s go-to meals. Now, I prepare it for my family very regularly. It’s a very comforting dinner and is loved by most, even picky eaters. 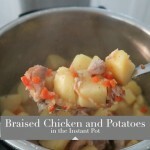 When I bought my Instant Pot a year ago, this was one of the first things that I tried to make in it and both my husband and I were so impressed, it immediately justified the purchase. One of my favorite functions on the Instant Pot is that it has a saute option, so you can brown meat or vegetables right in the same pot, instead of having to do it on the stove when using a slow cooker. This also means that once the meal is done cooking, you can also reduce the liquid if you want to, by turning up the heat and taking off the lid. I also LOVE how quickly everything cooks and that I don’t have to babysit it. You can also add some fresh or dry mushrooms for even more great flavor. The ingredient amounts are very flexible. If you like more meat, add more meat. If you want more potatoes, add more potatoes. The amount of water that I listed is enough to cook the potatoes through and have enough to pour over each portion in the bowl. Most of it will get absorbed by the potatoes the longer it stands. If you want a more stew-like consistency, add more water, if you don’t want any remaining liquid at all, add less water. This is the Instant Pot that I have. Turn on the “Saute” function on the Instant Pot on the highest setting and heat up the oil. Brown the chicken thighs in 2-3 batches, until golden on both sides. Set the chicken aside. You can also use pork or beef instead of the chicken, but you will need to cover the meat and aromatics with a bit of water and cook them until tender before adding the potatoes. Add the onions to the Instant Pot, continuing to cook it on the “Saute” function. Cook the onion until they are starting to soften, about 3-5 minutes. Add the carrots and the garlic, mixing to combine. 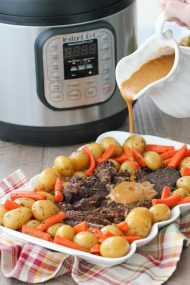 When you add the vegetables to the Instant Pot, they will give off some liquid, which will deglaze all the brown bits from the bottom of the pot and add flavor to the dish. Cook until the carrots are softened, another 3-5 minutes. Add the potatoes to the Instant Pot. Add a bay leaf. Do not mix the potatoes with the rest of the ingredients, leaving the potatoes as the top layer. Season the potatoes with salt and any herb mixtures that you like as well. I strongly recommend using the gold/yellow potatoes because they hold up really well in the pressure cooker. Other types of potatoes may fall apart and be mushier than the gold potatoes. Cover the Instant Pot with the lid and switch to the Manual function, high pressure, setting the time for 6 minutes. Manually release the pressure when the potatoes are cooked. If you use a different type of potato or meat, if you cut the potatoes a different size and if you use cold water instead of hot, this will all affect the cooking time. Check the potatoes after 6 minutes and if the potatoes aren’t cooked through, you may need to cook them for a few more minutes. If you use a different potato or you cut the potatoes smaller, the potatoes may be overcooked after 6 minutes. Garnish with fresh herbs. 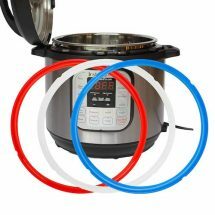 If you have any questions about the Instant Pot in general, I would be happy to try to answer and help you get the most out of this wonderful appliance. If you have an Instant Pot, what are your favorite things to make in it? Please share, I’m always looking for something new to try. What kinds of recipes would you want me to share? 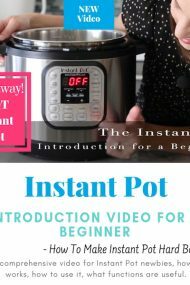 Here’s a video introduction of the Instant Pot for beginners. I share the basics, how I use it and demonstrate how to make hard boiled eggs while taking you through the functions and how to get started. This looks delicious! I also own that same exact pressure cooker and I love using it. Last time I made chicken noodle soup in it with homemade noodles, ohhh it’s our favorite. I just throw a whole chicken in there add few peppercorn, bay leaves and salt and cover with water to the max line and set it on 20 min. After it’s done, I take out chicken, strain the broth and throw in homemade noodles and cook for another 5 mix. Then you add chicken to your soup how much you want. It’s the most comforting soup ever! I also do plov in it, and when making soup with beef I like to speed the process by cooking beef meat in it. 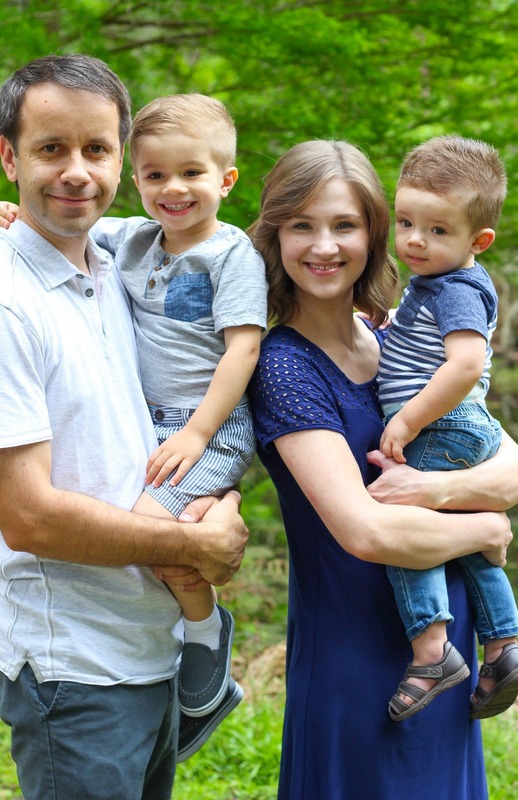 Thank you so much for sharing your recipe, Nataliya! I will have to try it, because it sounds delicious. If you have any other recipe suggestions, I would love to hear them too. I also love how quickly it cooks beef. I use it all the time now for Plov, Borsch, goulash and other recipes like that. Hi Olga! The less frequent posting is comletely understandable given your situation, I still enjoy the ones you get to post and recently loved your Q&A on Instastories. 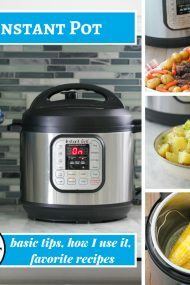 I would love more info on the Instant Pot. 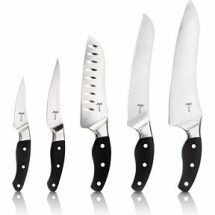 It seems to be a trend that has exploded the past year and I never looked into it because I try to be minimalist in the kitchen (because I cant seem to be minimalist in other areas.) 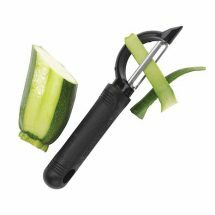 Doing a quick Amazon search upon your recommendation of this, I am a bit overwhelmed and would love to know what you think, or if you know, concerning the different brands and types of pressure cookers. Thanks in advance! Yay! So glad you enjoyed the Q&A on Instagram. Thank you so much for the support and understanding. 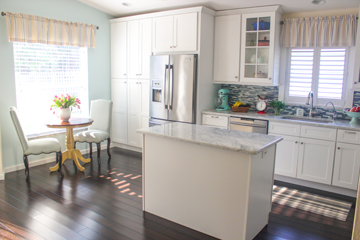 I completely agree with you about trying to be a minimalist in the kitchen. 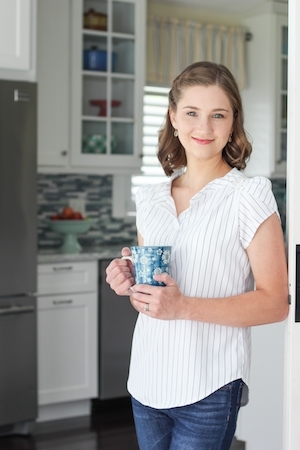 I try to limit appliances as much as I can because I don’t want to clutter up my kitchen with useless things or something that I don’t get a good use out of. I have had the Instant Pot for more than a year now, and I am so happy I bought it. I actually use it several times every week for many different things. Since I’ve only used this one, I don’t know anything about any other brands of electric pressure cookers, but I highly recommend the one I have. It’s a 6 quart, 7 in 1 electric pressure Instant Pot. I made braised potatoes with beef and my family loved it! Of course I had to cook the beef separately for 20 minutes but the potatoes and everything else just came out so flavorful and delicious that I plan on making some again this week! Thanks for the wonderful recipe! Your blog is one of my favorites and I refer to it each week when planning my menu. Take good care of yourself and don’t stress over posting often because we would rather have new recipes from you occasionally than not at all! Thank you for the kind words, Marina. I really appreciate that you took the time to write. It means a lot for me to hear your encouraging words, especially since I’ve been feeling very DIScouraged because I can’t post even half as much as I would like to. Olga, thank you for this recipe! I just made this in my Instant Pot. I actually tried it with white potatoes and set it at 5 minutes rather than the 6 minutes you recommend for yellow potatoes. (Thank you for the warning about using different potatoes) Anyways, it was perfect!! The potatoes still held their shape without turning into mush. 🙂 Super easy recipe — and I would love to see more Instant Pot recipes, if you are up for it. And girl, anyone who has kids will totally understand why your activity has gone down on the blog. Family comes first and we will be here for you every time you get the rare opportunity to post one of your tasty recipes! Don’t you worry about us! I’m so happy to hear that you enjoyed this recipe, Lana. Thank you so much for taking the time to write and let me know how it turned out and for your kind, thoughtful words of encouragement. It means a lot to me. Hi Olga, My mom bought me an Instant Pot for Christmas. I want to make beef plov in it. Have you ever tried making plov in it? Love to hear your news & see your delicious recipes but taking care of yourself & your beautiful family is more important. Wishing you well. Thank you for taking the time to write, Olga. I’m thrilled that you enjoyed the Braised Potatoes. Simple ingredients make the best and most comforting food, in my opinion. If I want to cook it in a Pot instead what would I change if I have to change anything even. Here’s a similar recipe for Braised Potatoes to cook on the stovetop, Olga. I used pork, but you can easily use chicken instead. Braised Potatoes Recipe.